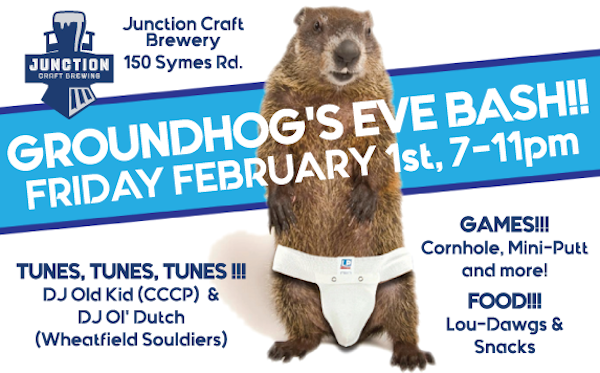 Good Times Groundhog Hockey Party at Junction Craft Brewing! TORONTO - Hey UUHA'ers: Our colleagues at the GTHLA are throwing a Groundhog Day-themed hockey party at Junction Craft Brewing and we're all invited! Additionally, Wheatfield Souldiers captain Chuck Molgat (a.k.a. DJ Ol' Dutch) will be spinning 45's for part of the night, so that right there may be worth donating a Toonie to the Daily Bread Food Bank. That donation will also earn givers a beer - compliments of the GTHLA - which is well worth the jaunt to 150 Symes Rd. to party at JCB's spacious home in the historic, art deco Destructor building. Also games, food... Details above. Hope to see many smiling UUHA faces there.